Am I in the broom closet? 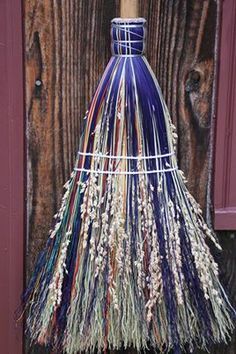 Being that I make videos on YouTube about witchcraft and my path, you would probably say that I am not in the "broom closet". You might assume that my family, all my friends and even some acquaintances know about my path. Wrong! I'm very much in the broom closet, but I've decorated and it's more like a comfortable cottage now. I don't wear my beliefs on my sleeve. I don't talk about my spiritual experiences to others. I don't wear a pentacle. I don't even hint about any aspect of where my beliefs lie. While I'm in the closet the door is comfortably open. I say that while I'm in the closet, but the door is open, I mean that I wouldn't and won't openly express my beliefs to my family; that said, it isn't a hidden fact. All they would have to do is look around my old bedroom and find piles of books on different aspects of witchcraft or find my old spell box and put 2 and 2 together. Now because I claim the title Christo-witch telling my dear Christian mother that I believe in Jesus isn't an out and out lie. But I also hold true to the divinity and equality of the Virgin as well, and am happy to see her in the guise of all female deity, and call the Virgin under many different names. Basically what I'm saying is, I don't discuss the intricacies of my beliefs with my family as it would cause more confusion than I care to deal with, so I keep it simple. Does my boyfriend know? Yes. He bought me a book on spells for Christmas. Do we discuss my path? No. Does that bother me? No! Do my friends know/call me a witch? I've never really cared to ask them what they think of my beliefs. I think it's sort of weird to try to figure out what they think of my beliefs. They do come to me for spells though - not ALL the time, but particularly on Halloween. I've given them readings, but even they know that if they want something completely objective they will go seek out someone. They have called me a witch, though I don't know if they are only kidding around. Do my friends, family or acquaintances know about my YouTube channel? My boyfriend does, my dad has seen one of my videos (by chance), and there are a few close friends of a similar mind set that know about my channel. Other than that, I hope to GOD no one else finds out. Even other close friends, I know they'd be fine, but the idea of them seeing my sorry mug on YT blabbing in a deeper way than they might realise would be...not mortifying, but wildly uncomfortable. That said I've been pretty drunk and felt really close to those I was with (in reality, I wasn't but sometimes I feel a strong unity with others when I've been on the sauce) and spilled the beans. I have embarrassingly drunk dialled my friend Charlie and told him I wanted to interview him - as I had a YT channel and wanted to talk to someone who wasn't very spiritual, about spirituality. At the time in my clouded thought, vision and memory, this was a grand idea - in the morning I get a call from Charlie asking when his close up would be - the memories all came flooding back, and me, mortified begged and pleaded that he forget everything I had told him. The scary thing was, is he seemed genuinely interested and later vowed he'd hunt my channel down. As I haven't heard from him, I'd like to think he stopped or hasn't bothered. THANK GOD! I really don't think being in the broom closet is a bad thing in that, I'm willingly and very comfortably there. I come and go as I please. That said I'm a pretty solitary creature and by very virtue of my star sign - a Scorpio - I'm more than comfortable keeping my cards close to me and revealing what I want, when I want. I do understand that there are those that really want their beliefs out there, and that sometimes being so utterly guarded is exhausting especially if you are in a home or community that would react hostilely to a Pagan belief system. I think especially for teenagers it is difficult to deal with this kind of broom closet scenario and subsequently sneaking around. While I don't think anyone should be stifled, I do think sometimes you do need to have a stiff upper lip about a broom closet situation and deal with it until you are of the age of majority - then it's much easier to do as you please. Sometimes dealing with teenage hormones can make "just dealing with it" extra difficult, but being obstinate really won't help anything your situation, in fact fighting with those that won't hear you anyway is an uphill battle. Sometimes keeping your opinions to yourself helps you in the long run, as it allows you to consider why they think the way you do, and allows you do evaluate what you believe. Once you reach the age of majority then it's much easier to let the opinions of others roll off your back - even if it's family. Growing up I had to do that, and while it was annoying and stressful sometimes, I think it really ended up feeding my practise now. As it did in some way teach me a certain degree of respect for rules that were in place in my household. That said my parents, my dad in particular encouraged the wide understanding of WHERE belief - any belief, culture, etc come from and why certain practises were in place. I have been exceptionally fortunate, and that might also be in part to my nature, and who has raised me. While I don't generally like to cause a ruckace, I also don't like to follow the crowd either. Thinking before you speak or act is key, and very much a part of what I think an earth based spirituality is about. I like to think that while I'm in a broom closet, there are also windows and doors that freely open, as well as guest rooms for people stay in.